During August and September I was a wee bit frustrated, bothered by my decision to stay in Scotland and do mountain trad projects, only to be met with a dire wet summer. Still I was aware how lucky I was to have these sorts of problems to worry about. 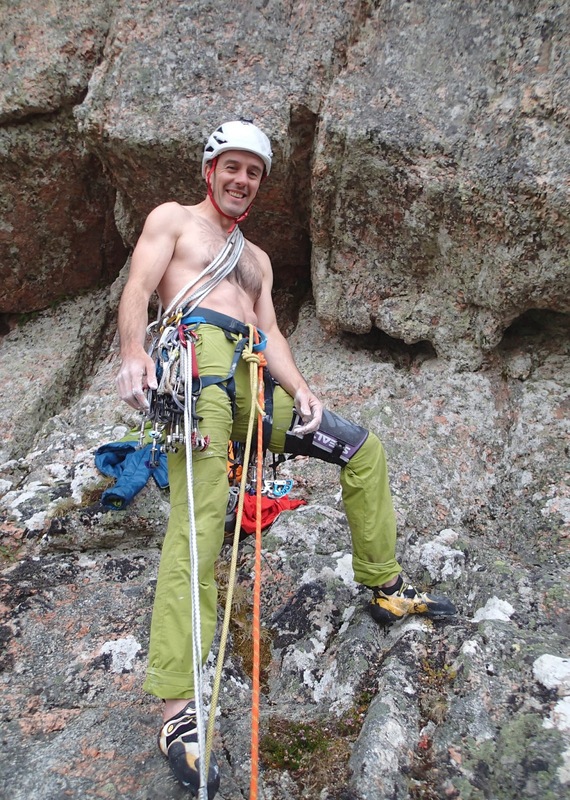 I did a ton of training and felt pretty fit, waiting for a weather window for a cool project on Binnien Shuas. My time finally came. As soon as the rain stopped I headed up with Masa, finished cleaning the line and tied in to lead it. Although it was a tough route and I didn’t expect to succeed first try, I was relaxed and just so delighted to be outside, with a cool breeze in my face and starting up a hard rock climb. Inspecting the new line. It will be an amazing route, when I get the opportunity to go back to it! I was just getting started, two moves up the route and was lifting my feet ready to place a good wire when suddenly I found myself hurtling backwards without warning. The big sidepull I’d been holding onto had broken off. 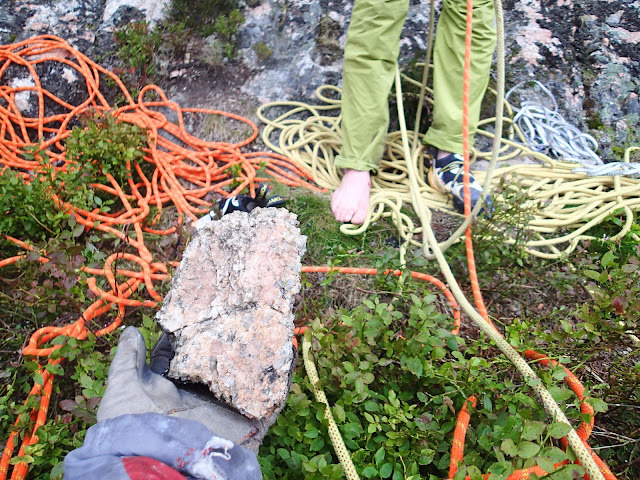 I landed on one foot on the rock slab below the route and somersaulted backwards, also knocking Masa to the ground. We picked ourselves up in a tangle of ropes and heather and Masa asked if I was ok. ‘Yes, but maybe not my ankle’. For a couple of minutes, I had a rather powerful adrenaline buzz, which faded to a looming feeling that things were not good. My leg and ankle were clearly ‘not right’. Sadly I am all too experienced with this situation and I defaulted to considering the immediate issue that I was at the top of a mountain with a broken leg and one hour’s walk and 30 min cycle away from the road. So I apologised to Masa and asked if it was ok if he would carry my lead ropes down the hill and if I could set off right away as I might be walking slowly! Masa agreed and said he would also retrieve my static rope which was also still hanging down the wall from having finished the cleaning. I set off, every step becoming more painful and more worrying. 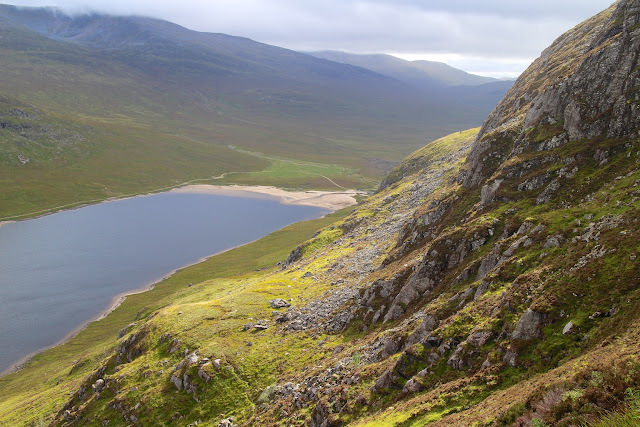 However, with the help of my walking poles I arrived back at the bikes in good time and could kid myself on that my leg was not too bad while I had it immersed in the cold water of Lochan na-h Earba. Masa was a long time behind me and by the time he appeared out of the darkness, my heart was pounding out of my chest with worry. He did in fact have his own considerable adventures en route to the top of the crag, opting for the quicker route by soloing a v-diff gully climb which I normally use to access the top myself (so knew how steep it was). 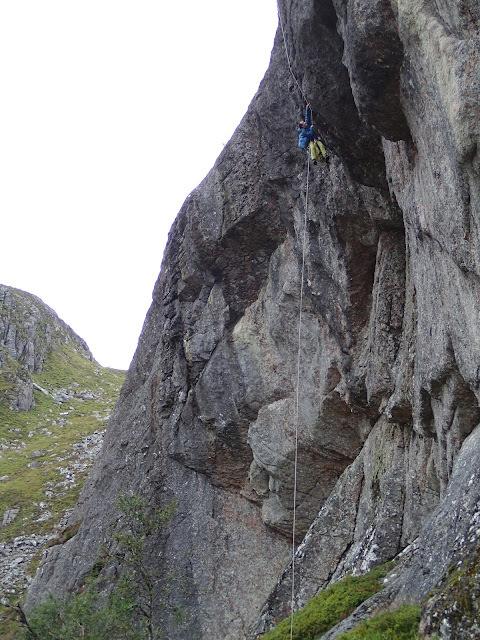 He slipped on wet grass on the final moves of this and fell 30 metres down the gully, apparently landing on his back, on his rucksack full of ropes and gear. Bruised but otherwise ok, he staggered off the hill behind me. A fair walk with a broken leg. Bikes left at the beach at the end of the loch. While he relayed this story to me as we limped onto our bikes in the dark, I wondered if I might be hallucinating because I was so worried to see Masa appear again that my brain might be inventing the image. I was nonetheless relieved to be on the bike and wobbling off down the track back to the road. Perhaps with the reappearance of Masa and the elapsed time since the injury my endorphin hit was wearing off, but I found it particularly challenging to get off the bike, walk it through the gate and get going again. By that point I was realising the game was up and I started to feel a bit low. 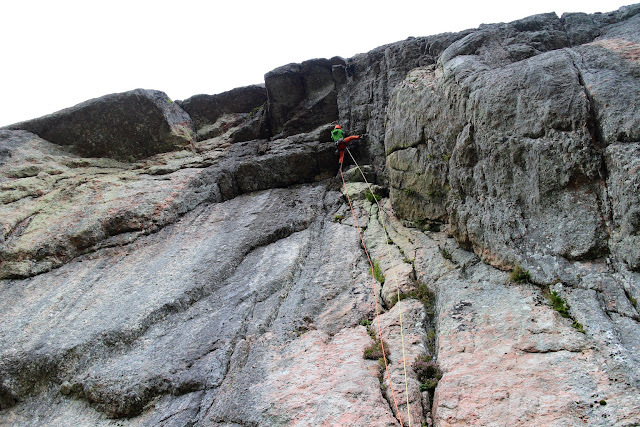 After several days of lying low, Masa was back out on the crags and climbing again. When I returned home, Claire retrieved by crutches out of the shed and I got used to the idea of being off my feet and off the hills again. My MRI confirmed a broken Tibia and various bits of damage to the ankle I had repaired in March 2015. I reasoned with myself that after getting myself through three ankle surgeries in four years, and over a year of that time on crutches, I was well equipped to just do it again. And anyway, what else would I do? It didn’t work out quite like that, as I will describe in the next part of this blog. Masa attacking the roofs of Ardanfreaky E3 5c, earlier in the afternoon. 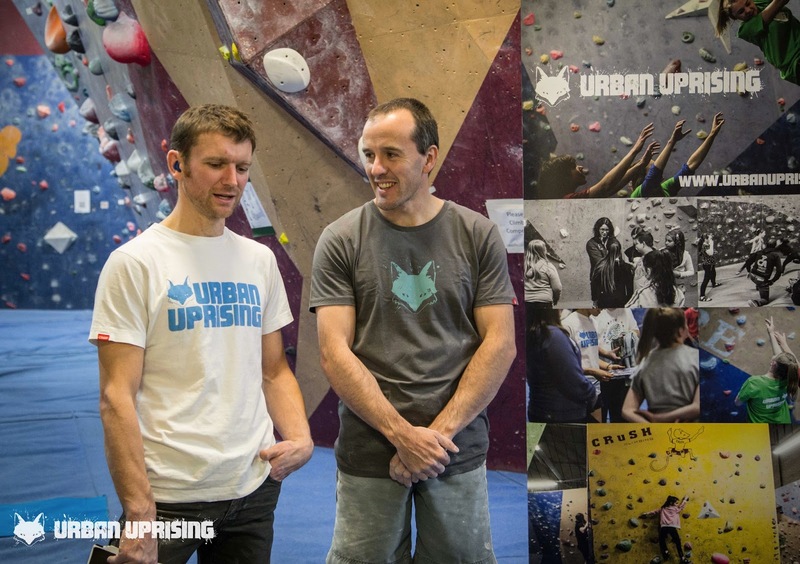 A couple of weeks ago I gave a talk at a big boulder comp/party event at TCA Glasgow organised by the charity Urban Uprising. Various talks I’ve done in the past have raised money for Climbers Against Cancer, various mountain rescue teams and others, but I mention this one specifically, just because I really like what they do and want to encourage you to support it. Urban Uprising take deprived or otherwise at risk kids climbing. Usually it’s the first time they’ve had an experience of an adventurous sport like climbing. In my view, this is a pretty special thing to do. I’m biased of course, because one experience I happened to have as a kid (randomly going out on my bike and finding mountains) totally changed my life. I have no doubt at all that this one experience not only set me on a path to make far more of myself than I otherwise would have, but it also allowed me to gain expertise I could then use to help others. I was lucky enough to have a bike, and the freedom to choose to go out on it and have this life changing experience without any direct influence from anyone at that moment. So many others have neither the freedom or the resources. One of the great problems with helping young people to help themselves is that no-one ever values them. So why would they value themselves? They are seen by so many others in society as a problem. Actually they are an opportunity. When someone takes time to show them something good, it will have a positive effect on almost all. For a subset, it will change everything. That is worth supporting. If you want to support them, head to their website, buy a cool T-shirt. Or just donate.